Under his own basket, Jared Christy slung a pass over the midcourt line to a streaking Kyle Roach, who took a few long strides and threw down a dunk. 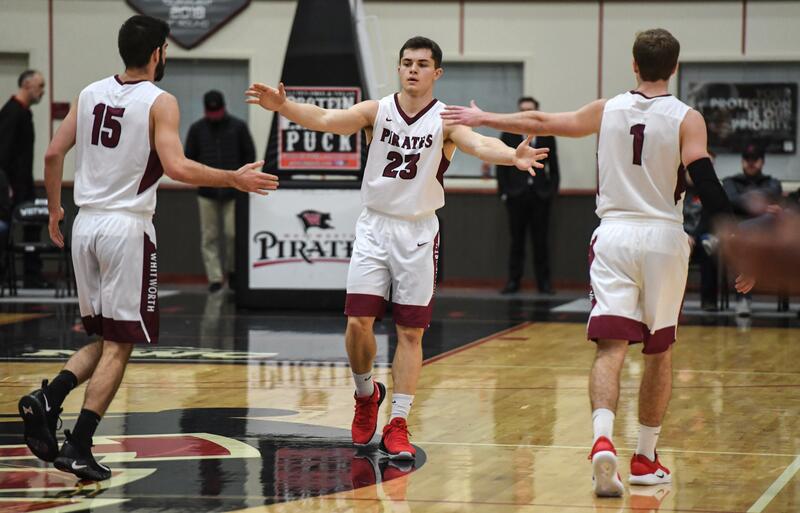 The play gave Whitworth a 17-point lead with 28 minutes of basketball left, and it epitomized how the veteran Pirates were going to beat Pacific’s trapping defense: Throw around and over it on the way to transition baskets, which seemed to get easier for them to get as the game went on. The Pirates weren’t perfect – they had 24 turnovers – and at half the score was 53-44, a relatively modest advantage given how the game finished. But the Boxers’ traps became less effective after halftime. The Pirates sank 19 of their first 23 shots in the second half, kicked off by a trio of 3-pointers from junior Ben College, and capped by a rim-rattling alley-oop dunk, Jordan Lester to Roach. That gave the Pirates 44 points in a 10-minute, 19-second stretch and a 97-76 advantage. Whitworth (5-1, 2-0 NWC) recorded assists on 41 of its 50 field goals, mitigating the inflated number of turnovers. Implementing the Grinnell System under new coach Justin Lunt, who was at Puget Sound the past 12 seasons, Pacific (3-4, 0-2) often substitutes five players at once, and 15 players get regular minutes. The idea is to force turnovers on defense and make a lot of 3s on the other end. But Whitworth consistently got layups and open 3s against the traps – it made 68.5 percent of its shots – and held Pacific to 11 of 41 on 3-point attempts. The Pirates also grabbed 20 more rebounds than the Boxers, led by Christy’s 17, and scored 80 points in the paint. That was where senior post Ben Bishop camped out, and he sank all eight of his shots (he missed 1 of 2 free-throw attempts) for 17 points. College had a game-high 24 points. Lester, a junior, added 18. The Pirates will host three nonconference foes this month, starting next Saturday against La Verne. Published: Dec. 1, 2018, 9:14 p.m. Updated: Dec. 1, 2018, 11:07 p.m.